This is a Hand Signed Colour Publicity photo 5.5" x 3.5" by the American Country and Western singer. 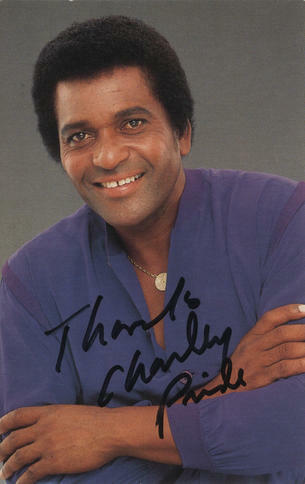 Charley Frank Pride (born March 18, 1938) is an American country music singer, musician/guitarist, recording artist, performer, and business owner. His greatest musical success came in the early to mid-1970s when he became the best-selling performer for RCA Records since Elvis Presley. In total, he has garnered 39 No. 1 hits on the Billboard Hot Country Songs charts. Pride is one of the few African-American country musicians to have had considerable success in the country music industry and only the second African American to have been inducted as a member of the Grand Ole Opry.